Technical support: Technical support from Jarltech is free of charge for software companies and system integrators. Regular training courses and programmes from our manufacturers ensure that our service personnel is informed about the latest developments and changes. We will gladly assist you with any problems regarding hardware integration and installation. We also provide an extensive support database on our website www.jarltech.com with all documents, drivers, manuals and extra tips for all devices. Repairs & warranty claims: All incoming warranty claims are processed on the same day. 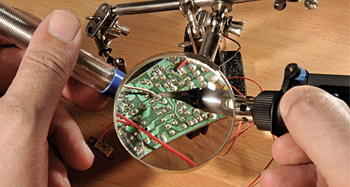 If we can locate the defect on our own, we repair your goods immediately or send them back to the manufacturer. As a certified Epson Service Center, we are able to perform warranty repairs directly. This means that we do not need to send defective devices to the manufacturer, saving you valuable time. Spare part service: Jarltech provides several hundreds of thousands of spare parts from various manufacturers. For example, we are an official spare part supplier for Epson POS printers, Zebra label printers and Datalogic barcode scanners. Jarltech's internet support section contains exploded views for many products; these will help you to easily identify (and order) modules, worn parts, even single screws and other small parts.